e pair of sweaty shoes or boots every day. Fingernails that are wet for hours at a time due to a job or hobby are also susceptible. 3. Put on a clean pair of socks every day and whenever your socks get sweaty. This helps prevent fungi from growing. Wearing moisture-wicking socks can also reduce the need to change your socks. 1. Alternate shoes. Fungi thrive in moist places like damp shoes. You can reduce this growth by giving shoes 24 hours to dry out before wearing them again. 2. Sprinkle antifungal powder in your shoes. These products cannot treat a fungal nail infection, but they can help prevent fungus from growing in your shoes. 3. Keep your nails short. When trimming your toenails, you want to cut them straight across and keep your toenails shorter than the end of your toes. Fingernails should also be kept short. This helps prevent fungi and other germs from getting under your nails. 4. Sanitize your nail clipper before using it. To sanitize your nail clipper, wash it with soap and water and then wipe it with rubbing alcohol. 5. Never share nail clippers, shoes, skates, towels, and other personal items. You can easily pick up a fungal infection by sharing a personal item. People also get athlete’s foot and ringworm (a fungal infection on the skin) by sharing personal items. 6. Keep your feet clean and dry. Carefully wash your feet with soap and water every day, taking care to wash between your toes. Dry your feet well after washing them. 7. Moisturize dry skin. Fungi can get in through small cracks in your skin. To ease dry skin, moisturize within 5 minutes of bathing and after washing your hands. 8. If you get athlete’s foot, treat it right away. Fungi also cause athlete’s foot. 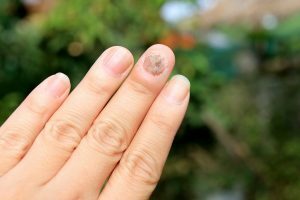 This fungal infection can spread to your nails. To rid the infection, Bella Aesthetica MedSpa uses lasers and light treatments to clear nail fungus.